A Portland man’s homophobic behavior has caught up with him. Again. 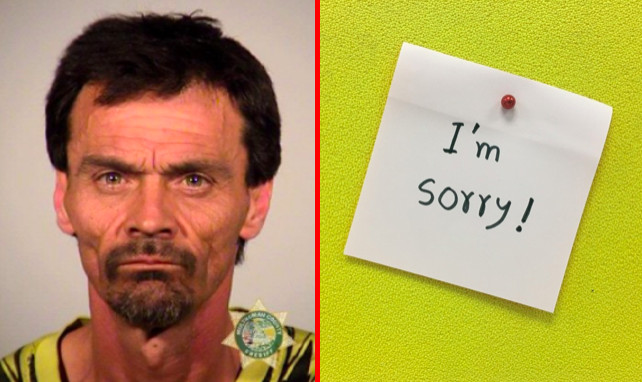 47-year-old Scott Wayne Smith was just convicted of second-degree intimidation, which is listed as a hate crime under Oregon law, for threatening to kill a gay man who wouldn’t give him a cigarette. It all started last August when Smith approached to men sitting on a bench outside a residence for people living with HIV/AIDS. Many of the people who live there are gay. Smith demanded the men give him a cigarette. When they ignored his request, he flew into a rage. And this wasn’t the first time he had done so. Prior to the cigarette incident, prosecutors say he threatened to bomb the building , telling the residents who lived there he was going to “kill all you people” last August. Smith originally pleaded not guilty but changed his plea to no contest last week. He was sentenced to 21 days in jail with credit for time already served, plus two years of probation and a list of other conditions, including writing a letter of apology. “We believe this is an appropriate resolution that holds Mr. Smith accountable for specifically targeting the victim based on his sexual orientation, which is a protected class in Oregon,” Marrero says. Homophobia is the least of his concerns. He’s a nut job. Yet another criminal with the middle name WAYNE! Looks like someone’s been hitting the meth pipe a bit too much.